Storekeeper, Assistant Storage Superintendent. 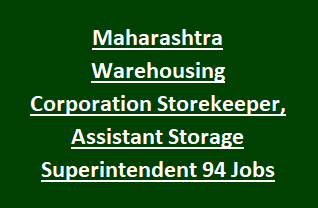 Candidates who are interested and having necessary qualifications they can apply for these Maharashtra Warehousing Corporation Storekeeper, Assistant Jobs. Candidates selection for these vacancies will be held through merit in Written Exam only. Last date for submission application for this Maharashtra Warehousing Corporation Storekeeper and other vacancies is 30-01-2018. Number of posts, qualifications, online application submission process, exam pattern and other details about this Assistant, Storekeeper jobs of Maharashtra Warehousing Corporation Recruitment Notification 2018. There are total 94 Posts in this Maharashtra Warehousing Corporation recruitment 2018 Notification. Candidates must have qualified Degree for applying these vacancies. Must have MS-CIT certificate or its equivalent qualification is required. For General category candidates upper age limit is 18-38 years. Candidates selection will be held through written examination only which will be conducted for 200 marks of objective type.